Peruvian Reverse Painted Glass Wall Mirror, "Turquoise Chorus"
All is peace and beauty in this delicate scene, as Gelacio Girón depicts songbirds and flowers. 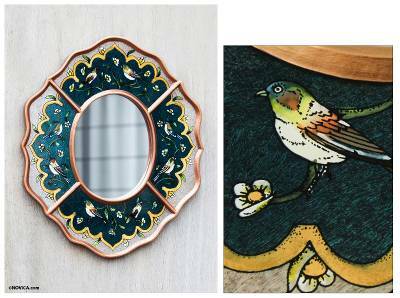 Capturing the scene on reverse painted glass, he creates a beautiful wall mirror. Gilt enhances this original design. You can find reverse painted glass mirror 'Turquoise Chorus' by Gelacio Giron in wall decor categories such as Animal Themed Mirrors, Reverse Painted Glass Mirrors, Glass Mirrors and Wood Mirrors. Enjoy exploring these sections for other Novica treasures.